The invasion of Ukraine has kicked off, and our tanks are rolling across the countryside. The American and Ukrainian forces were not enough to stop the Russian advance, and have been scattered into many individual groups, all seeking to delay us in whatever way they can. 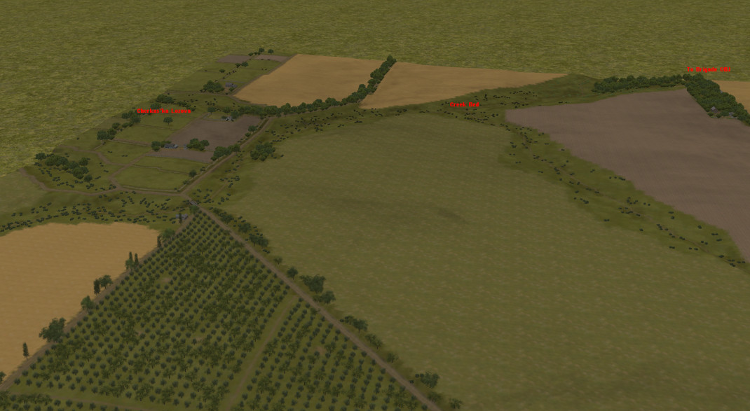 As the commander of your Russian Brigade Tactical Group’s lead reconnaissance element, you are responsible for locating these NATO forces and either bypassing or destroying them. As your brigade pushes to Kiev, your patrol’s lead vehicle is stopped by sympathetic locals, just east of a large orchard. They hurriedly explain that an American platoon with a tracked vehicle in support have established a position overlooking your brigade’s main avenue of advance. The only way the main body can continue down this road unhindered is for you to dig the Americans out of their delaying position, located just west of the orchard. 2 Comments on "AD Bradley Speedbump"
Lost a couple of BTRs and 4 men. First time I think I’ve properly implemented and succeeded with a solid mechanized assault. Very nice work, and as someone else posted, a great little skirmish. I just do not see how AI can see through the smoke screens? even when deployed smoke screens the Javelins don’t miss. i’m playing on Veteran, and can not seem to get any kind of fire superiority. the only thing I see is you have them USA forces turned up to super AI?